Many business executives overlook importance of web design in overall marketing performance, but truth is it can make or break your campaign, especially if you’re marketing online. While your company marketing may be what gets grabs people’s attention and gets them to take action, your web design will often decide whether or not they make the purchase. Here are some strong arguments to prove the importance of web design in a marketing campaign. Studies show that 75 percent of people judge the credibility of a business based on the design of its website. 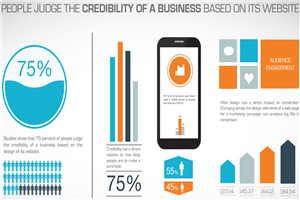 Obviously, credibility has a direct relation to how likely people are to make a purchase. That means that you are losing customers if your site has poor design. You need to ensure that your website conveys that you are a legitimate and trustworthy business, which is often determined by the quality of the web design. Another strong argument for web design is that; web design has a direct impact on conversion. Changing simply the design elements of a web page for a marketing campaign can produce big lifts in conversion. In competitive advertising channels, small lifts in conversion can give you the edge over your competition. Making more profits from your advertising means you can purchase a higher volume of ads and push out other advertisers. Web design is also more than the visual presentation of a website. It also consists of usability, user interface and site architecture, which are all things that are underneath the surface. Improving these aspects of design results in a lower abandon rate, higher time spent on site, increased referrals and improved conversion path. To maximize the results of your marketing campaign, you need to work on improving these areas of design. Since you’ve read all these points, you should be able to gather how important web design is in a marketing campaign. It impacts the effectiveness of a campaign both directly and indirectly. That’s why it’s a smart decision to invest in quality web design if your website currently isn’t up to par.